I am pleased to meet you on the occasion of your Plenary Assembly. I thank the Cardinal Prefect for the words he has addressed to me and I greet you all, members, collaborators and consultors of the Congregation for Divine Worship and the Discipline of the Sacraments. This Plenary comes at a significant time. Fifty years have passed since, on 8 May 1969, Saint Paul VI wished to establish the then Congregatio pro Cultu Divino, in order to give shape to the renewal desired by Vatican Council II. It was a matter of publishing the liturgical books according to the criteria and decisions of the Council Fathers, with a view to fostering, in the People of God, “active, conscious and pious” participation in the mysteries of Christ (cf. Constitution Sacrosanctum Concilium, 48). The praying tradition of the Church needed renewed expressions, without losing anything of its millennial wealth, even rediscovering the treasures of its origins. In the first months of that year the first fruits of the reform accomplished by the Apostolic See flourished for the benefit of the People of God. On precisely this date the Motu proprio Mysterii paschalis was promulgated regarding the Roman calendar and the liturgical year (14 February 1969); then, the important Apostolic Constitution Missale Romanum (3 April 1969), with which the Holy Pope promulgated the Roman Missal. In the same year the Ordo Missae and various other Ordo were issued, including those relating to the baptism of the children, marriage and funerals. They were the first steps of a journey, to be continued with wise constancy. We know that it is not enough to change the liturgical books to improve the quality of the liturgy. To do this alone would be a deception. For life to be truly a praise pleasing to God, it is indeed necessary to change the heart. Christian conversion is oriented to this conversion, which is an encounter of life with the “God of the living” (Mt 22: 32). This is also the purpose of your work today, aimed at helping the Pope to carry out his ministry for the benefit of the Church in prayer all over the earth. In ecclesial communion both the Apostolic See and the Bishops’ Conferences operate in a spirit of cooperation, dialogue and synodality. 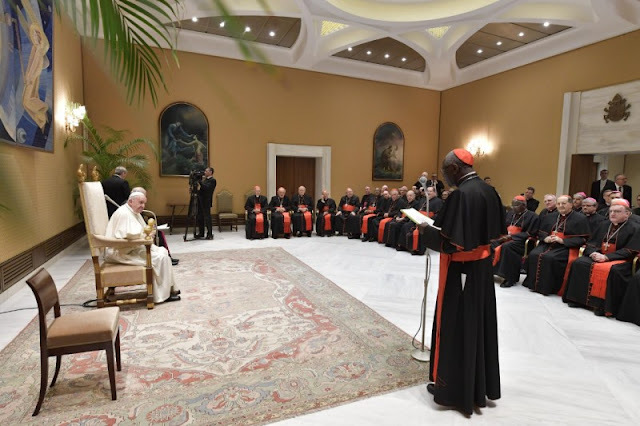 In fact, the Holy See does not replace the bishops, but works with them to serve, in the richness of the various languages and cultures, the prayerful vocation of the Church in the world. The Motu proprio Magnum principium (3 September 2017) follows in this line; in it, I intended to promote, among other things, the need for “a constant collaboration filled with mutual trust, vigilant and creative, between the Episcopal Conferences and the dicastery of the Apostolic See which performs the task of promoting the sacred liturgy”. The hope is to continue on the path of mutual collaboration, aware of the responsibilities involved in ecclesial communion, in which unity and variety are united. It is a question of harmony. Here we find also the challenge of formation, the specific object of your reflection. Speaking of formation, we can not forget, first of all, that the liturgy is life that forms, not an idea to be learned. It is useful in this regard to remember that reality is more important than the idea (see Apostolic Exhortation Evangelii gaudium, 231-233). And it is good therefore, in the liturgy as in other areas of ecclesial life, not to end up favouring sterile ideological polarizations, which often arise when, considering our own ideas valid for all contexts, we tend to adopt an attitude of perennial dialectic towards who does not share them. Thus, starting perhaps from the desire to react to some insecurities in the current context, we risk then falling back into a past that no longer exists or of escaping into a presumed future. The starting point is instead to recognize the reality of the sacred liturgy, a living treasure that can not be reduced to tastes, recipes and currents, but which should be welcomed with docility and promoted with love, as irreplaceable nourishment for the organic growth of the People of God. The liturgy is not “the field of do-it-yourself”, but the epiphany of ecclesial communion. Therefore, “we”, and not “I”, resounds in prayers and gestures; the real community, not the ideal subject. When we look back to nostalgic past tendencies or wish to impose them again, there is the risk of placing the part before the whole, the “I” before the People of God, the abstract before the concrete, ideology before communion and, fundamentally, the worldly before the spiritual. In this sense, the title of your assembly is valuable: The liturgical formation of the People of God. The task that awaits us is indeed essentially that of spreading among the People of God the splendour of the living mystery of the Lord, Who makes Himself manifest in the liturgy. Speaking of liturgical formation in the People of God means first and foremost being aware of the indispensable role the liturgy holds in the Church and for the Church. And then, concretely helping the People of God to interiorize better the prayer of the Church, to love it as an experience of encounter with the Lord and with brothers who, in the light of this, rediscover its content and observe its rites. Since the liturgy is an experience extended to the conversion of life through the assimilation of the Lord’s way of thinking and behaving, liturgical formation can not be limited to simply offering knowledge – this is a mistake – though necessary, on liturgical books, nor even to protect the dutiful fulfilment of the ritual disciplines. In order for the liturgy to fulfil its formative and transforming function, it is necessary that the pastors and the laity be introduced to their meaning and symbolic language, including art, song and music in the service of the mystery celebrated, even silence. The Catechism of the Catholic Church itself adopts the mystagogical way to illustrate the liturgy, valuing its prayers and signs. Mystagogy: this is a suitable way to enter the mystery of the liturgy, in the living encounter with the crucified and risen Lord. Mystagogy means discovering the new life we have received in the People of God through the Sacraments, and continually rediscovering the beauty of renewing it. Regarding the stages of formation, we know from experience that, in addition to the initial phase, it is necessary to cultivate the ongoing formation of the clergy and laity, especially those who are involved in the ministries serving the liturgy. Formation not once, but continuing. As for the ordained ministers, also in view of a healthy ars celebrandi, the Council’s appeal is valid: “A prime need, therefore, is that attention be directed, first of all, to the liturgical instruction of the clergy” (Apostolic Constitution Sacrosanctum Concilium, 14). First of all. The educational responsibilities are shared, even if the individual dioceses are more closely involved in the operational phase. Your reflection will help the dicastery to develop guidelines and indications to offer, in a spirit of service, to those – episcopal conferences, dioceses, training institutes, journals – who have the responsibility of taking care of and accompanying the liturgical formation of the People of God. Dear brothers and sisters, we are all called to deepen and revive our liturgical formation. The liturgy is in fact the main road through which Christian life passes through every phase of its growth. You therefore have before you a great and beautiful task: to work so that the People of God may rediscover the beauty of meeting the Lord in the celebration of His mysteries and, by meeting Him, have life in His name. I thank you for your efforts and I bless you, asking you to always reserve for me a place – a large one! – in your prayer.